As web-based consumer businesses have taken root, we have evolved our thinking at the Chasm Group to reflect how technology adoption operates in this world. Unlike enterprise B2B markets where mainstream adoption chasms happen in transitioning from high risk to proven solutions, the world of web-based applications and social media is one where systems of engagement rule. For this sector, we created the Four Gears Model. 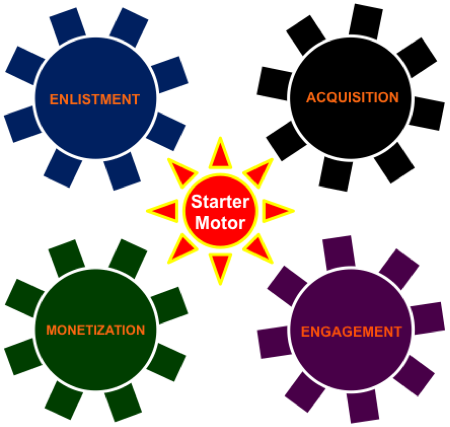 The Four Gears are Engage Consumers, Acquire Traffic, Enlist Evangelists, and Monetize. Here, the market adoption gears spin in anything but a linear progression, and usually start with freemiums as a starting point. ENGAGE: The first step for web-based consumer businesses is to create an experience that is so compelling and differentiated that users will want to repeat it. Repetition creates a pattern of consumption that is a key underpinning of a mass market. ACQUIRE: This second gear is about driving traffic, and seeks to answer the question…can this business scale. But the Acquisition gear modifies the Engagement gear in what is an iterative process. Acquiring new customers with additional needs places demands on your product to engage those new users. So as you onboard new consumers, you onboard new content to broaden the offer to appeal to a growing, more diverse user base. ENLIST: As you approach your product tipping point, it’s time to scale like crazy. Now you must hyper-engage with a small, vocal minority of users who have shown a propensity to evangelize on your behalf. They love you because they believe in you so much that your product is part of their identity. In a perfect world, your evangelists would definitely recommend you to a friend. This is what fuels viral marketing and drives down cost of consumer acquisition. But this vocal minority may be people who generally like your product and might recommend you to a friend. This forestalls churn but doesn’t drive virality. And if your vocal minority has concerns about recommending you, you can experience counter-evangelism (think “Super Size Me”, a movie about McDonalds). MONETIZE: Finally, we come to the topic of monetization. The Four Gears model is about your URL…Ubiquity Now, Revenue Later. This is where many web-based consumer businesses stumble. Monetization slows the gears so you have to feather it in. Done too soon or quickly, it pops the clutch and stalls the engine. It takes a lot of experimentation to get the pricing right, and every money move you make requires ramping the engine back up as fast as possible. Interestingly, many highly successful web-based consumer businesses are sold to larger entities at very heady valuations without dealing with monetization. Putting it together, the number one priority for web-based consumer businesses is rapid adoption, number two is engagement (using your service intensively), and number three is enlistment/referrals. Get that right and the money will follow. If you’re a $20M company with 55 employees like WhatsApp, how does $19 billion grab you? Invite retail customers to take advantage of great Thanksgiving weekend prices to increase yearly revenue. Build customer loyalty. Retail customers typically reward retailers with their business if the perception of product value and quality and service is consistent with their first experience on Thanksgiving weekend. Ads touting big discounts are the order of the day, but the second goal, establishing a long-term relationship with the customer, is a harder nut to crack, especially in shaky economic times. How might a company ensure that consumers will come back after the Black Friday frenzy is over? Introducing "My Best Buy," a new loyalty program consisting of three tiers of progressively added incentives that includes bonus points for purchases, concierge-type customer service, and extended return privileges. With their retail traffic at its peak in the next few days, Best Buy is hoping that the combination of discounts and perks will provide the right opportunity to increase sales and retain customers through the holidays and beyond. Retailers don't want a one-time customer sale and great prices with great service initiates the feeling of customer loyalty. Many businesses would do well to consider how to implement their own double-barreled approach this holiday season. Have you experienced excellent sales and service recently? Which stores have earned your loyalty?